Tetlow King Planning (TKP) has successfully promoted a strategic site in West Cheltenham through the Joint Core Strategy (JCS) for Gloucester, Cheltenham and Tewkesbury 2011-2031. The site comprises 191 hectares of green belt land which adjoins the western urban edge of Cheltenham and is in close proximity to GCHQ. The land is primarily agricultural and the western part is occupied by a sewage treatment plant. The land was originally designated as safeguarded land in the submission draft of the JCS, with no prospect of development until the next review of the JCS in 2031. Actively participating at the JCS examination, TKP successfully managed to persuade the Inspector that exceptional circumstances existed for the immediate release of the land from the green belt. 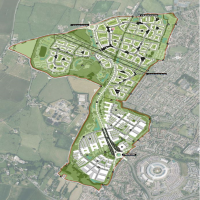 The site was accordingly allocated for an employment-led mixed-use development include approximately 1,100 dwellings and 45 hectares of employment. The remainder of the site was designated as safeguarded land for long term development needs for Cheltenham. The development will deliver employment-led development focusing on cyber security and associated technology industries which have natural synergies to GCHQ. The site will also deliver a sustainable mixed-use development which successfully integrates with its surroundings through the creation a comprehensive network of green infrastructure and provision of variety of community facilities which will benefit existing and future residents. The scheme has the backing of Government and has successfully secured £22 million in growth deal funding as a catalyst for infrastructure improvements. TKP is currently coordinating the preparation of an outline planning application including environmental statement which is expected to be submitted in early 2019.